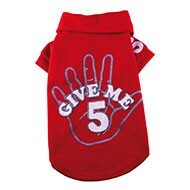 A lovely red polo for the French Bulldog and Pugs, for the fresy days of the year, that is made of 100% cotton. This lovely red polo for the French Bulldog, Pugs and the like has a sportive look and is well suited for the fresh days of the year. The polo has a nice print on the back and a 5 on the arms. The cotton is soft so that the dog keeps its freedom of movement.